For my project, I created an animated children’s book. 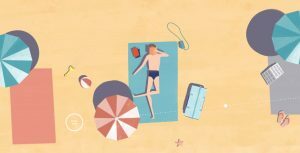 This project was really exciting to create as I was able to practice using simple and more complex animation. With having 10 pages, I focused on experimenting with different kinds of animations and page turning effects. All of the backgrounds were drawn by me! The animated objects were also drawn by me, or created in p5.js. For the sake of cleanliness and consistency, I decided that drawing the background images myself would be the best possible solution. The code is structured by creating an array of functions that implements the functions by indexing through a page number counter. 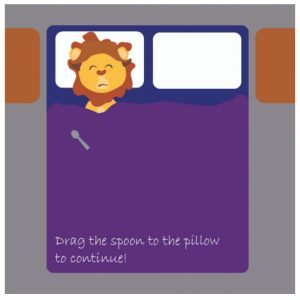 On page 4, the Giraffe suggests for the Lion to sleep with a spoon under his pillow to make it rain, so the user must move the spoon to the pillow. When the spoon is within the boundaries of the pillow, it flips to the next page. On page 5, I chose to do a simple page turning animation where the user must click within the boundary of the page turning image. While not nearly as complex as other pages, it was necessary to add this page for the sake of the story! On page 9, the animals are having a party so I created an object animation of balloons floating to the top of the page. When the array length (i.e # of balloons) reaches 10 balloons, it moves to the next page. 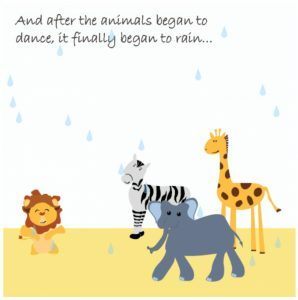 On the last page, the animals begin to dance and I use a frame animation to flip through images of the animals moving. It also begins to rain and I created an object animation of rain falling from the top of the canvas. Since I created a lot of my own images, I decided to package this project on my computer and run it on a local server. After it connects, open up http://localhost:8000 in your web browser. If you get confused on how to move to the next page, remember the different page turning implementations i.e clicking on the jittering objects, completing the animation, or simply waiting (i.e for ten balloons to appear). For my project proposal, I am creating an animated children’s book. I have found two interactive stories that, while more advanced, have really interesting levels of interactivity. The first project is “ENOUGH” by Isaac Cohen. 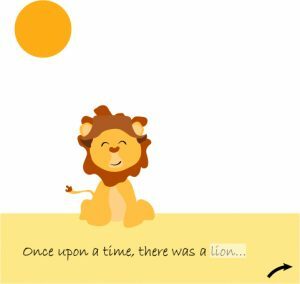 This project is an animated story that loads as the user clicks the logo. 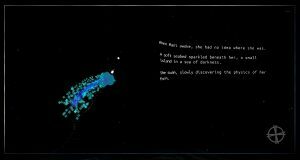 I find this project really interesting because of its high level of interactivity from the words moving with the mouse and the jellyfish-like creature following the mouse. The second project is “a short journey” directed by Cher Ami. I appreciate this project for its very direct animation and creative use of interactivity. As each screen loads there is a “drag here” button that the user pulls across a line to begin the animation. For example the one on the right, zips the bag. When the animation ends, it moves to the next page.The aesthetic of this animation is truly beautiful. 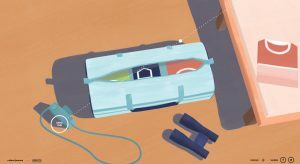 While both projects, are graphically quite different, they both grab the user and pull them into the story, through quite simple (to the user) animations. It’s really exciting to see how this concept can be produced and animated in such different ways. For my project, I am proposing an animated children’s book. Each time the user clicks the arrow, it will move to a new page of the book. 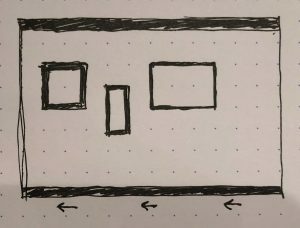 I am proposing that each page has one animation triggered by the user clicking on highlighted text. An animation could be the sun moving, plants growing, or rain falling. I am still considering whether the majority of the animation will be hand coded in p5.js or if that will be specifically for the animated objects. 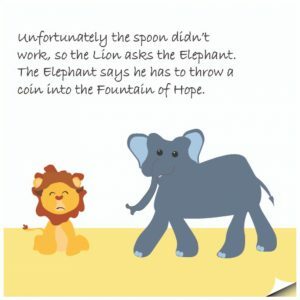 It depends on how complicated the final storyline becomes. It may be easier to do a hybrid where the static objects are drawn and the animated objects are coded. I believe this project will help me learn more about interactivity and animation within p5.js. I am excited to see how this process goes! Beyond the Fence is the world’s first computer generated musical, created by Benjamin Till and a team of researchers. There’s a hint of Romeo and Juliet (or should that be West Side Story?) 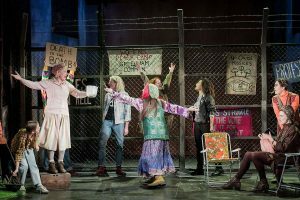 to the burgeoning relationship between Mary and Jim, a touch of Miracle on 34th Street to the George subplot, and the idea of a band of women taking a stand against oppressors has been rehearsed in the West End as recently as last year’s short-lived musical staging of Made in Dagenham. This project is extremely interesting because most modern arguments suggest the computer will never be as creative as the human, especially concerning emotional factors, but this project applied creativity in a useful way. 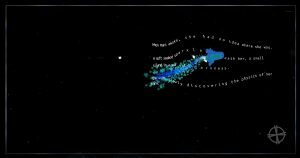 After computing the aspects of the plot, the team filled “in the dots.” With most computer generated work, there is a layer of human decision making (even going back to the creation of the algorithm) so things such as the dialogue and blending the lyrics from the poetry generator were created at the hands of the team. Somewhat relying on the machine to inspire their own creativity. With the advantageous use of these algorithms, the reliance on the “What-If Machine” allowed the team to use their talents elsewhere and fall prey to the surprising output of the machine. The music was created with the algorithmic composing software, Android, the plot-generating script, PropperWryter, and lyric-generating, Clarissa the Cloud Lyricist, with their own software the “What-If Machine.” It was a collective effort of many collaborators and creators to fully realize this computational musical. 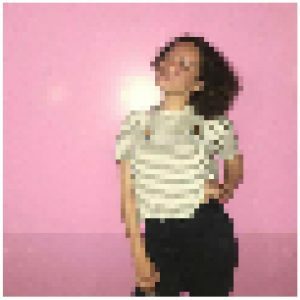 This project as a reference for sound art, is quite inspiring to go past the so-called restrictions of machine-learning and computer generated software’s to create something brand new, yet realistic and familiar. It would be really interesting to see what would happen if these algorithms ran throughout the musical, constantly changing its plot and premise- almost like an improv. Read more about the project here & here! 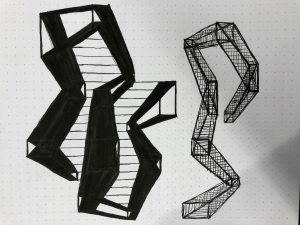 While these are more complex, they are based on the same principle of connecting squares and rectangles which was the basis for my project. For this project, I was inspired by a museum gallery wall where you walk through a room of framed paintings, photographs, etc. and it creates a landscape of art. I used this sketch to begin my project. I wanted to randomize the size of the art, the size of the frame, and the colors of the wall, border, and painting. Adding in the small abstract shapes to the paintings increases the randomness of the landscape. Because all of these are in flux, it creates a compelling composition of objects in space. Trying to define the boundaries of these objects so that they wouldn’t overlap was quite challenging, but I learned a lot more about objects and conditions through this process. For this week’s blog post, I am taking a deeper dive into the Howeler + Yoon Architecture firm from Min Lee’s Week 8 Looking Outwards on Meejin Yoon. I actually had the pleasure of seeing 2 of their projects on a studio trip to Boston last summer. One project I really want to highlight from this firm is the Collier Memorial on MIT’s campus. This project is a memorial to an officer, Sean Collier, that was shot and killed in 2013. As most memorials result in statues, plaques, benches, etc. I remember being completely inspired by this project’s ambition, structure, and integration into the public landscape. Now looking further into this project, and learning more about the firm from Meejin Yoon, I have learned that the entire design and structural analysis utilizes computational design. I believe the project mainly utilizes Rhino 3D Modeling Software and Grasshopper, a Rhino plug-in for computational and parametric design. 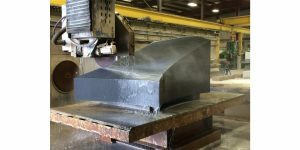 The structure being constructed of 32 granite blocks presents new challenges that are wouldn’t be the same for something like poured in place concrete. 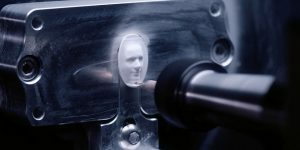 So for this project, not only was the design computational, but the actual fabrication of these pieces used a combination of manual labor and robotic sawing. Fabrication of memorial at Quarra Stone Co., in Madison, Wis.
What I really appreciated in Min Lee’s piece is the emphasis on the idea of public/private space. 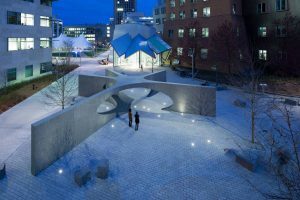 With the Collier memorial, the project has transformed a public area to create new spaces for the public to interact with, rather than look at or observe. This firm is really combining their design goals with the right tools and software to make them happen. For this project, I wanted to create a pixel grid that becomes smaller and thus, clearer as the user clicks! I wanted the image to stop at a certain resolution so it maintains the pixelation effect, so it resets after a certain amount of clicks. 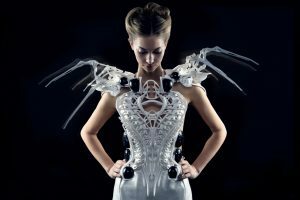 Anouk Wipprecht is a Dutch, female artist working in the field of Couture Fashion, but at the intersection of analog design and robotics. 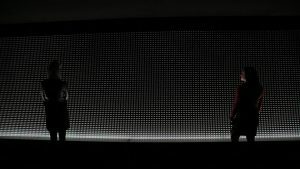 Eyeo 2016 – Anouk Wipprecht from Eyeo Festival on Vimeo. One of the most interesting projects to me is the Spider Dress, which “attacks when you come close to it.” Anouk has been especially interested in defining these spaces of interaction with fasion, i.e the tiers of space around our bodies. Attached to the shoulders are robotic arms which expand from this boundary of personal space into the social space as people approach the dress and model. Link to video of dress here! What I love about this artist is her actual deployment of these intersectional ideas. There exists a conceptual level of her work which influences the development of her work and eventual fabrication. At each of these levels, the others don’t fault. “FashionTech” is defined as “a rare combination of fashion design combined with engineering, science and interaction/user experience design.” The idea of fashion, as more than a garment, that exists on our bodies, in the space around us, and as a response to the environment we exist in is such a holistic approach to an everyday idea we take for granted. 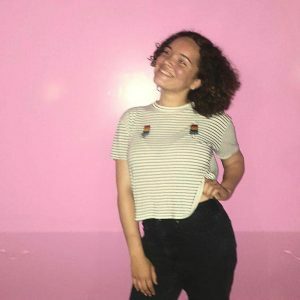 Read more about the artist here!